Devialet 4500W Phantom Speaker - Gold. If you want the very best sound in the world. Here it is, Gold Phantom. Smash buy it now, you won’t be disappointed. Weather you are listening to music or having the Devialet hooked up to your T.V. 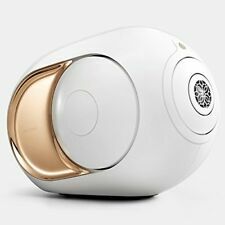 BEST WIRELESS SPEAKER IN THE WORLD: The most accurate and powerful speaker from Devialet creates a live concert experience. It features our exclusive Analog Digital Hybrid Technology. With power, clarity and precision unlike anything you’ve heard before. Phantom is the best wireless speaker in the world. Music : Play your music wirelessly from any device, streaming service or your own collection via AirPlay or Bluetooth. Movies: Use the optical input on Phantom or Dialog to connect to your TV for the ultimate movie experience with rumbles down to 14Hz.